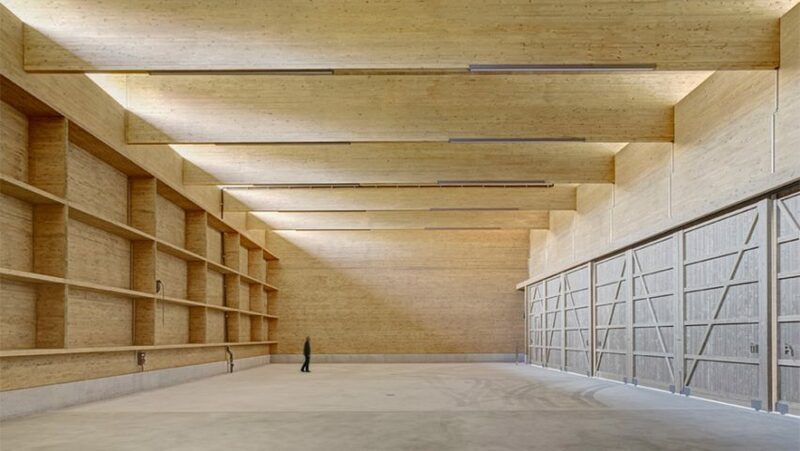 A+Awards: it took just 18 minutes to regrow the timber used to build this entirely wooden warehouse in Switzerland, according to Rossetti + Wyss Architekten, which won a 2016 Architizer A+Award for the project. The Zurich firm designed the Workshop Andelfingen for the regional government's waterways engineering operations centre to house vehicles and machines, and as a place to undertake minor construction work. The structure is built solely from wood, slotted together using techniques adapted from traditional log construction. It took just two days to assemble the parts on site, and even less time for the soft wood harvested for the project to replenish – due to the amount of evergreen trees replanted in the country and the speed that they grow. "The timber used regrows in Switzerland in 18 minutes," said Rossetti + Wyss co-founder Mark Aurel Wyss. A total of 36 solid wood planks were used to build the warehouse. Long elements form the sides of the building and interlock at the corners. 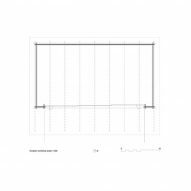 These step out slightly as the building rises, creating a gently tapered form. At the top, thin beams cross the shorter span to support the overhanging. Gaps between allow in air and make the building glow at night. Without the need for insulation, the planks are visible both inside and out. Each has a structural purpose and only the bare minimum material was used. "The workshop is a statement of reduction of means, creating a sculptured body made of piled up load-bearing elements," said Wyss. "Everything that is necessary is there, with nothing superfluous added." Workshop Andelfingen won in the Factory Warehouse category at the 2016 A+Awards. Photography is by Mark Aurel Wyss.